"Nouveau Flowers" digital stamp, shoujo-style, dreamy and versatile, easy to colour! This one has been in my sketchbook for a long time.... over a year, maybe more. I never finished it because I was too hasty to ink without making sure her profile was correct (one of those days...)! Also drew it too close to my sketchbook's binding so it was trashed. So a few days back, I thought a face-only digistamp will be nice as the collection needs some variety. 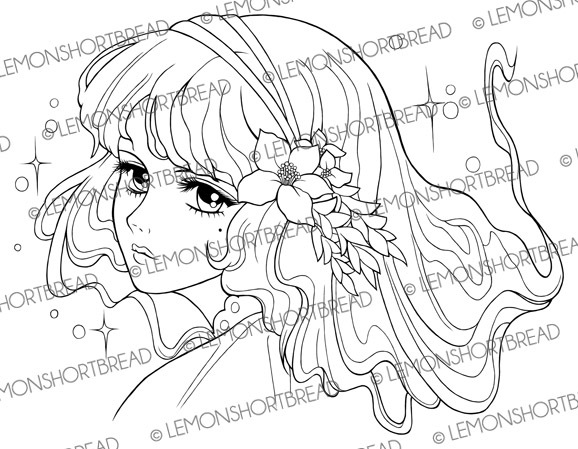 Re-found this and made her hair all wavy and nouveau-ish, scanned it and redrew her face in Photoshop. My linearts nowadays are all redone in Photoshop.